I was not surprised to see the paper below this week in Science. I have read all of Mike Baillie’s books, as well as ‘Catastrophe’ by David Keys, leaving me feeling as though I had actually lived through the 6th Century. The inescapable conclusion of the popular books and the hard science is that something quite horrid happened during this period. Dr. Baillie, one the world’s most experienced and published dendrochronologists, has maintained for over a decade that the sum of all the evidence; tree rings, ice chemistry and (heretically) written accounts from the time, suggest that it was a horror from above — not below — that led to the worldwide decline of trees, global cultural upheavals, and human health reversals such as the Justinian Plague. As might be expected, other scientists disagreed with Baillie’s conclusion and instead finger an unidentified equatorial volcano for the misery of the era. Chief among these critics is Keith Briffa of “Climategate” fame. Over the next week or two, the Tusk plans to dig more deeply in the drift of evidence for the ~536 event and it’s cause. I hope to bring attention to what I believe is another attempt to brush away the reasoned conclusion of a respected mainstream scientist — Mike Balllie — by a group of thinkers consumed by an agenda that discourages free inquiry or alternative explanations. 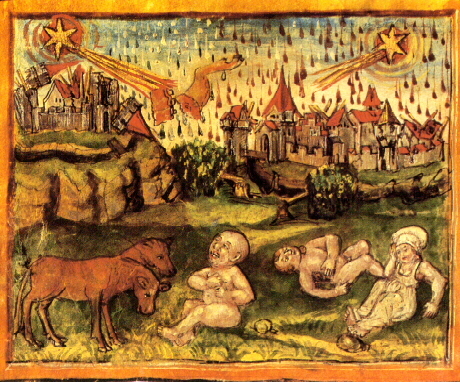 The dispute can be characterized as the two typical camps of thought in our discussion: 1) Those who believe the earth climate during human history is a closed system without the influence of space debris; and, 2) Others like Baillie and many Tusk readers who believe that space borne material has from time-to-time intersected the earth during recorded human history and changed the course of civilizations by inducing rapid climate change and its consequences. This single blog post for the time being will be a “living document,” to which I hope to add any insights or evidence — pro-or-con — from readers, as well as fleshing out the issues at hand in several perfecting posts. So please stay tuned, and join in if you like. 6th century downturn: Secret volcano or cosmic interaction? Authors: Abbott, D. H.; Biscaye, P.; Cole-Dai, J.; Breger, D.
We examined the solid fraction of melt water from a depth of 361.45-361.55 meters in the GISP2 ice core. This subbottom depth covers the time from 536.15 to 536.66 A.D. roughly from February 24th to August 28th, 536 A.D.[1,2]. Earlier work measured a Cl value of 64 ppb from 535.9 to 536.2 A.D. roughly from November 24th, 535 A.D. to March 14th, 536 A.D. . This is the highest nonvolcanic Cl value in the last 2000 years. The Cl value of 48 ppb from 536.2 to 536.5 A.D. or roughly from March 14th to July 1st, 536 A.D. is the third highest nonvolcanic Cl value in the last 2000 years. These high Cl values are at the same time as the beginning of an 18-month long period starting in March of 536 A.D. when ‘ the sun gave no more light than the moon’ . Because there is no evidence for a volcanic eruption during this 18-month time period, some authors have proposed a cosmogenic origin for the dust veil . Our data supports the latter hypothesis. We have found 5 perfectly round, smooth spherules at the depth corresponding to early 536 A.D. Three of the spherules are pure iron oxide. They range in size from 0.3 to 1.3 micrometers in diameter. One spherule is mixed silicate plus iron oxide, with a diameter of 0.5 micrometers. One spherule is Na-K aluminum silicate, with a diameter of 2.6 micrometers. The spherules occur in association with crystals of titanium oxide and zircon, and partially crystalline Ca-Na feldspar. Associated K-Na feldspar and quartz grains have sharp edges. The largest grains in the sample are translucent C-O spheroids of volatile material that is sensitive to the electron beam. The translucent C-O spheroids often contain small amounts (0.2 to 2 percent) of Na and Cl. We also found some calcium carbonate precipitate. We interpret the perfectly round FeO and silicate spherules as impact spherules. The associated crystalline and sharp edged grains are also impact ejecta. The mixed chemistry of the spherules and the lack of Ni are inconsistent with their origin as ablation products from meteorites (i.e. cosmic spherules). Instead they must have originated from a terrestrial impact event. We have found an impact ejecta layer in the Gulf of Carpentaria, Australia that contains abundant magnetite spherules with quench textures and ablated surfaces. Using existing carbon-14 ages, the spherule horizon is from an impact that occurred prior to 900 A.D. and after 70 A.D . The most likely source craters in the Gulf formed from an impactor that was about 640 meters in diameter, in line with the 600-meter estimate of  for the diameter of the impactor needed to produce the dust veil event of 536-537 A.D. Because the age and impactor size are both a good match within the errors of our data, the Carpentaria impact event is our best candidate for the source of the impact spherules in the GISP2 ice core. However, much more work remains before we can be certain that the impact into the Gulf of Carpentaria was the source of the dust veil event that began in March of 536 A.D. . Meese et al., 1994. Science, 266:1680-1682. . Sowers et al., 1993. Paleoceanography 8:737-766. . Mayewski et al., 1997. J. Geophys. Res., 102:26345-26366. . Stothers, 1984. Nature 307:344-345. Rigby et al., 2004. Astron. Geophys. 45:1.23-1.26. Abbott et al., submitted, Geophys. Res. Lett.